Electric Power Accessories Corporation is a wholly owned Canadian company that strives to produce the highest quality product for the electric utility industry. We bring more than 40 years of experience as a dependable manufacturer and supplier. Our commitment to quality is proven by our ISO-9001-2000 certification. Electric Power Accessories Corporation has been in business since 1960. Originally located in Brampton, Ontario, Canada, in December 1997 Electric Power Accessories Corporation relocated to a new and modern facility in Guelph, Ontario. We incorporate a network of agents and distributors across North America to ensure quick and knowledgeable service. Under new ownership since 2000, the mandate to manufacture and supply quality products to our customers has been maintained and enhanced. Electric Power Accessories Corporation designs, manufactures and distributes the EPACTM brand hardware and insulators for the electric utility industry. These products are in use across Canada and around the world. EPACTM brand insulators include: fibreglass guy strain, standoff, extension, phase spacing insulators, cutout and arrestor brackets. EPACTM brand connection hardware include hot line, stirrup, dead end, saddle and suspension clamps. 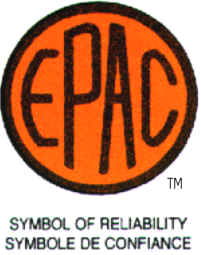 EPACTM brands are carried on a variety of street lighting, multiple street light relays and photocell adapters. To serve our customers better, Electric Power Accessories Corporation also stocks and distributes a large variety of related products used in the utility industries at competitive prices. Our on line catalogue represents only a portion of our inventory. Please call our order desk for more details on the wide range of products available. Let Electric Power Accessories Corporation show you how we can serve your company with a reliable source of products at reasonable prices.